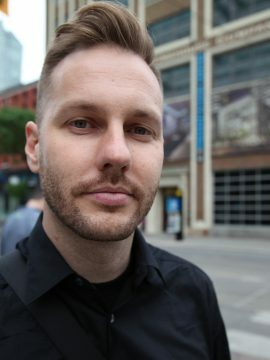 Dr. Jay Hosking is a Lecturer in the Department of Psychology at the University of British Columbia, where he teaches a number of courses related to neuroscience and psychology. He obtained his BSc Hons in Neuroscience at the University of Toronto, graduating with High Distinction. He completed his PhD in Neuroscience at the University of British Columbia, teaching rats to gamble and exert mental effort. He completed his Postdoctoral Research Fellowship in the Department of Psychology at Harvard University, where he extended his decision-making research to human populations. He also obtained a Master in Fine Arts in Creative Writing at UBC, and his debut novel, Three Years with the Rat, was published by Penguin in Canada, Macmillan in the United States, and RAO in Romania. His fiction and nonfiction has been appeared in such publications as the Globe & Mail, National Post, and the Walrus. In the rest of his time, Jay walks creatures in natural places, and tinkers with guitars, synthesizers, and microphones. Research interests include individual differences, cost/benefit decision making, effort, motivation, neuromodulators, dopamine, drugs, addiction, rats, functional neuroimaging. Dr. Hosking's research has appeared in prestigious journals including Neuron, Cerebral Cortex, Neuropsychopharmacology, and PLoS ONE. Hosking, J. G., Kastman, E. K., Dorfman, H. M., Samanez-Larkin, G. R., Baskin-Sommers, A., Kiehl, K. A., . . . Buckholtz, J. W. (2017). Disrupted prefrontal regulation of striatal subjective value signals in psychopathy. Neuron, 95(1), 221-231.e4. Barrus, M. M., Hosking, J. G., Cocker, P. J., & Winstanley, C. A. (2016;2017;). Inactivation of the orbitofrontal cortex reduces irrational choice on a rodent betting task. Neuroscience, 345, 38-48. Tremblay, M., Silveira, M. M., Kaur, S., Hosking, J. G., Adams, W. K., Baunez, C., . . . Dalley, J. (2017). Chronic D2/3 agonist ropinirole treatment increases preference for uncertainty in rats regardless of baseline choice patterns. European Journal of Neuroscience, 45(1), 159-166. Cocker, P. J., Hosking, J. G., Murch, W. S., Clark, L., & Winstanley, C. A. (2016). Activation of dopamine D4 receptors within the anterior cingulate cortex enhances the erroneous expectation of reward on a rat slot machine task. Neuropharmacology, 105, 186-195. Hosking, J., Floresco, S., & Winstanley, C. (2015). Dopamine antagonism decreases willingness to expend physical, but not cognitive, effort: A comparison of two rodent Cost/Benefit decision-making tasks. Neuropsychopharmacology, 40(4), 1005-1015. Barrus, M. M., BA, Hosking, J. G., PhD, Zeeb, F. D., PhD, Tremblay, M., MA, Winstanley, C. A., PhD, & Zeeb, F. D., PhD. (2015). Disadvantageous decision-making on a rodent gambling task is associated with increased motor impulsivity in a population of male rats. Journal of Psychiatry and Neuroscience, 40(2), 108-117. Hosking, J., Cocker, P., & Winstanley, C. (2016). Prefrontal cortical inactivations decrease willingness to expend cognitive effort on a rodent Cost/Benefit decision-making task.Cerebral Cortex, 26(4), 1529-1538. Tremblay, M., Cocker, P. J., Hosking, J. G., Zeeb, F. D., Rogers, R. D., & Winstanley, C. A. (2014). Dissociable effects of basolateral amygdala lesions on decision making biases in rats when loss or gain is emphasized. Cognitive, Affective, & Behavioral Neuroscience, 14(4), 1184-1195. Hosking, J., Lam, F., & Winstanley, C. (2014). Nicotine increases impulsivity and decreases willingness to exert cognitive effort despite improving attention in "slacker" rats: Insights into cholinergic regulation of Cost/Benefit decision making. Plos One, 9(10), e111580. Hosking, J., Cocker, P., & Winstanley, C. (2014). Dissociable contributions of anterior cingulate cortex and basolateral amygdala on a rodent Cost/Benefit decision-making task of cognitive effort. Neuropsychopharmacology, 39(7), 1558-1567. Hosking, J. (2014). the great lakes. Dalhousie Review, 94(1), 21-27. Tremblay, M., Hosking, J., & Winstanley, C. (2013). Effects of chronic D-2/3 agonist ropinirole medication on rodent models of gambling behaviour. Paper presented at the , 28 S218-S218. Cocker, P., Hosking, J., Benoit, J., & Winstanley, C. (2012). Sensitivity to cognitive effort mediates psychostimulant effects on a novel rodent Cost/Benefit decision-making task.Neuropsychopharmacology, 37(8), 1825-1837. Hosking, J., & Winstanley, C. (2011). Impulsivity as a mediating mechanism between early-life adversity and addiction: Theoretical comment on lovic et al. (2011). Behavioral Neuroscience, 125(4), 681-686. For a full list of publications, visit Google Scholar. As as full time lecturer, Dr. Hosking does not supervise graduate students.